You have a closet full of desi clothes that you don’t need due to the following reasons: They are out of fashion, not the right size anymore, you have worn them enough or need to make space in your closet. Most of these clothes are in great shape and have a lot of life left in them. 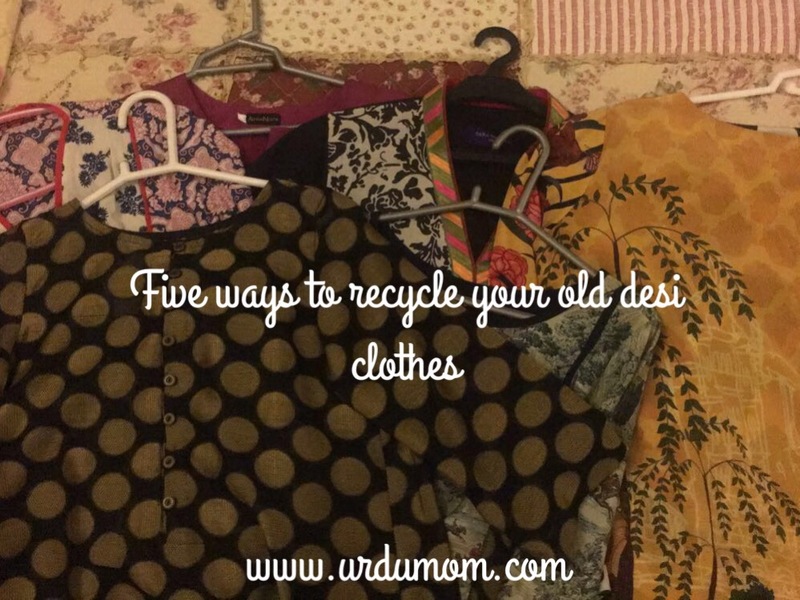 If you are wondering what to do with old desi clothes here are five ways to recycle them in meaningful ways. You have a lot of desi clothes lying around? guess what, so do a lot of your friends. Since you all have the same problem of what to do with old desi clothes, you can come up with a collective solution. Arrange a clothes drive, where all of you donate your used clothes in great condition. Make sure all clothes collected are washed, ironed and on a hanger. Now rent a community centre or borrow someone’s garage and arrange an event where people can come pick these clothes for free or for $1 each. Spread the word in refugee service centres, local mosques/churches/libraries/schools and desi grocery stores. You can make posters and a facebook event page. You can also ask for volunteers to provide transport to high need families. Make sure people get privacy and respect when they come to pick the clothes. A change room really helps. Shadi joras are expensive and hardly used for more than a couple of times. While you may be tired of your jahaiz clothes (or not fitting in them anymore! ), they can really help girls in Pakistan and India who are getting married and can not afford these clothes. Organizations such as JDC welfare organization and Edhi centres are always looking for wedding clothes in great conditions. Your family in Pakistan or India might also know of families that might need these for an upcoming wedding. Get all your clothes packed, get some friends to contribute theirs too and split the cost of shipping to South Asia. Consider the shipping cost as part of your charity. Your shadi joras will bring a smile on many faces and it will definitely be worth the effort. Ever heard of: One woman’s kurta is another one’s treasure? Maybe, not exactly these words but you get the meaning! If you haven’t made a trip back to Pakistan or India recently, you are always looking for a new kurta, a vibrant dupatta or a new pair of khussas without spending a lot of money buying new ones from exhibitions. Make it a one-dish and everyone brings a snack (this is a desi event, so ofcourse food comes first). You can only bring in clothes, shoes and accessories in great condition. Clothes must be cleaned, ironed and on a hanger. When you enter, you get a coin for every item in great shape that’s accepted (you can also use monopoly money). Now you can use those coins to pick items that other people have brought in! One coin for one item. Enjoy gupshup, chai and have fun picking a new wardrobe! Some local organizations like Value Village, Goodwill Centre etc in areas with a dense immigrant population will take desi clothes as donations. Some mosques also have collection drives. Ask around and you might be able to help someone close to you! If you need to donate your desi clothes fast and don’t have time to ask around or arrange an event, post it on social media! Most cities have “buy and sell” facebook groups or “free items one”. You can also use kijiji, craigs list etc. You can arrange for the collection to be at a public location if you don’t wish to disclose where you live. Post a picture along with size information and that it’s for free. You can put conditions such as must be collected today based on your urgency. These were a few suggestions of what to do with old desi clothes and to recycle them in meaningful ways. If you know of a specific organization or resource, do share and I would be happy to add that information here for everyone’s benefit. Thanks. These are amazing ideas! MaashAllah. I like the emphasis on clean new, ironed clothes and the concept of getting gold coins for each item that is added in the friends gathering.